The Link Magazine provides low cost, affordable advertising offering fantastic value for money. Advertising with us costs less than a cent per household for a quarter page advert. 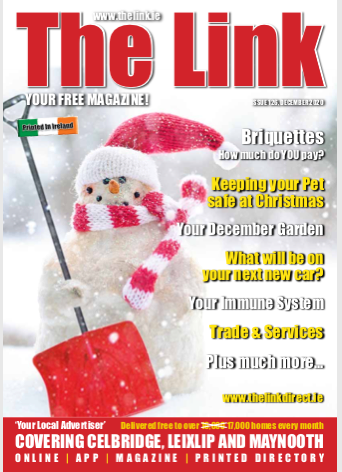 We print and deliver 17,000 copies of The Link Magazine to homes in Celbridge, Leixlip and Maynooth. Our monthly magazine, now in our ninth year is always delivered towards the start of each month. The Link is produced in full colour A4 to a high specification, and delivered FREE to homes in the above areas with the copies been left in shops, pubs, and businesses throughout the 3 towns. The Link Magazines are not thrown away each month like a local newspaper. People keep it as a form of reference for the whole month. As well as local advertising we have a listing of what’s on in our area. Our team offer a design and artwork service for it’s advertisers, so there is no need to worry if you don’t have an advert already prepared. Simply send your information and our designers will do the rest. The Link Magazines constantly receive feedback from advertisers regarding return on their investment and number of calls generated from adverts each month. The Link works hard to ensure it is an essential tool in any sales and marketing drive. A Question to business owners. Where do the vast majority of your customers live? It is estimated that more than 90% of small and medium businesses customers LIVE LOCALLY. So who do you want to reach? The 10% who live out of the area, or the 90% who live locally? The Link Magazine is targeted to the most populated towns in YOUR area. There is no point in selling your wares through a newspaper left in Tesco Balbriggan for 3 days of the month when your business is situated in North Kildare. We deliver door-to-door PLUS we leave magazines in selected businesses throughout your town. Coupled with the best rates on the market, we really do deliver FOR YOU. Contact Us Today to place your advert in The Link Magazine.